Now I know you all missed me! I missed you all too but more importantly, I missed writing about food. So shall start doing that right away. Today I am going to be talking about CHEESE. We all love cheese. "Amul cheese" is everyone's favorite in India, whether its on maggi or in sandwiches and dosa or on paranthas and pao bhaji. Cheese is derived by curdling the milk and is available in a wide range of flavors, textures and forms. Some of the few famous types are Cheddar(regular processed cheese like Amul), Feta, Parmesan, Mozzarella, Gouda, Blue Cheese, Gorgonzola. 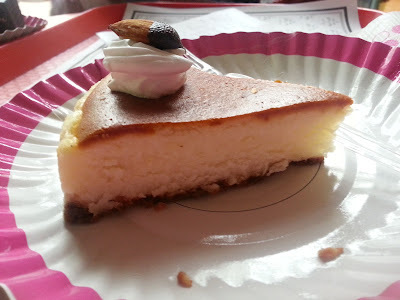 Cheeses which are used in making desserts, mostly Cheesecakes are Mascarpone, Cream Cheese and Ricotta. People relate cheese to getting fat but it is not fattening if consumed in small portions and is an excellent source of phosphorus, calcium, protein and B12. If you ask me, my personal favorite is Feta Cheese which originates from Greece and is made using Goat's milk. Its sharp, tangy, slightly salty and mildly sour flavor goes really well in salads. Feta can be also crumbled over stir fried or grilled vegetables. It tastes excellent with guava too!!! 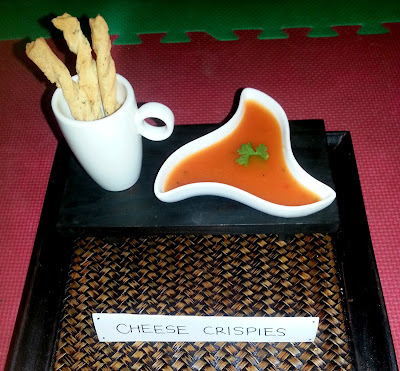 Having talked about different types of cheese, let me share a recipe which uses our very own Amul processed cheese. Its called Cheese Crispies. I had kept this item in both of my Bake Sales and this was the first item to be sold out both the times. Its yum and very simple to make and can be eaten with soup or just munched on. Preheat oven to 200 degrees. Grease a baking tray. Mix together the grated cheese, butter, sugar, salt, red chili powder, mixed herbs and cream in a bowl. Add flour and mix into a dough. Roll out the dough into a half-inch thick rectangle on a lightly floured surface. Cut into nine-inch long and half-inch wide strips, twist and place a little apart on the greased baking tray. Bake for about 10 minutes at 180 degree, turn them upside down and bake for further 5 minutes or until pale golden brown. Remove from oven and transfer to a plate to cool. This recipe is very simple to crack. Don't think that its difficult just because it involves baking. 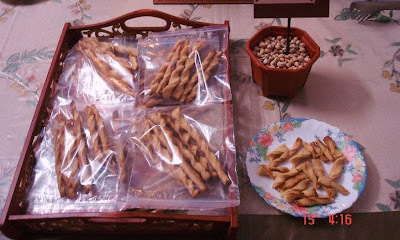 It is exactly like making "mathri", only difference being that these cheese crispies are baked instead of deep fried, so take your mom's help for guidance. I have started my own page called Fascinatingfoodworld on facebook and my twitter handle is @nishbes. Follow me if you wish to be updated on the posts.